Pontormo painted in and around Florence, often supported by Medici patronage. A foray to Rome, largely to see Michelangelo's work, influenced his later style. Haunted faces and elongated bodies are characteristic of his work. An example of Pontormo's early style is The Visitation of the Virgin and St Elizabeth, with its dancelike, balanced figures, painted from 1514 to 1516. The large altarpiece canvas for the Brunelleschi-designed Capponi Chapel in the church of Santa Felicita in Florence, portraying The Deposition from the Cross, is considered by many Pontormo's surviving masterpiece (1528). On the wall to the right of the Deposition, Pontormo frescoed an Annunciation scene (at right). As with the Deposition, the artist's primary attention is on the figures themselves rather than their setting. Placed against white walls, the Angel Gabriel and Virgin Mary are presented in an environment that is so simplified as to almost seem stark. The fictive architectural details above each of them, are painted to resemble the gray stone pietra serena that adorns the interior of Santa Felicità, thus uniting their painted space with the viewer's actual space. The startling contrast between the figures and ground makes their brilliant garments almost seem to glow in the light of the window between them, against the stripped-down background, as if the couple miraculously appeared in an extension of the chapel wall. The Annunciation resembles his above mentioned Visitation in the church of San Michele at Carmignano in both the style and swaying postures. A number of Pontormo's other works have also remained in Florence. The Uffizi Gallery holds his mystical Supper at Emmaus as well as portraits. Perhaps most tragic is the loss of the unfinished frescoes for the church of San Lorenzo which consumed the last decade of his life. His frescoes depicted a last judgement day composed of an unsettling morass of writhing figures. The remaining drawings, showing a bizarre and mystical ribboning of bodies, had an almost hallucinatory effect. Florentine figure painting had mainly stressed linear and sculptural figures. For example, the Christ in Michelangelo's Last Judgment in the Sistine Chapel is a massive painted block, stern in his wrath. By contrast, Pontormo's Jesus in the Last Judgment twists sinuously, as if rippling through the heavens in the dance of ultimate finality. Angels swirl about him in even more serpentine poses. If Pontormo's work from the 1520s seemed to float an a world little touched by gravitational force, the Last Judgment figures seem to have escaped it altogether and fly through a rarefied air. Vasari's Life of Pontormo, depicts him as withdrawn and steeped in neurosis while at the center of the artists and patrons of his lifetime. This image of Pontormo has tended to color the popular conception of the artist, as seen in the film of Giovanni Fago, Pontormo, a heretical love. Fago portrays Pontormo as mired in a lonely and ultimately paranoid dedication to his final Last Judgment project, which he often kept shielded from onlookers. Yet as the art historian Elizabeth Pilliod has pointed out, Vasari was in fierce competition with the Pontormo/Bronzino workshop at the time when he was writing his Lives of the Most Excellent Painters, Sculptors, and Architects. This professional rivalry between the two bottegas could well have provided Vasari with ample motivation for running down the artistic lineage of his opponent for Medici patronage. Perhaps as a result of Vasari's derision, or perhaps because of the vagaries of aesthetic taste, Potormo's work was quite out of fashion for several centuries. The fact that so much of his work has been lost or severely damaged is testament to this neglect, though he has received renewed attention by contemporary art historians. Indeed, between 1989 and 2002, Pontormo's Portrait of a Halberdier (at right), held the title of the world's most expensive painting by an Old Master. Influenced by Leonardo da Vinci (1452-1519) and Andrea del Sarto (1486-1531), Pontormo worked for the Medici, Borgherini and other families of the Florence Renaissance, making his initial reputation with fresco works at the Medici villa at Poggio a Caiano. The story of Pomona and Vertumnus is the classic Greek mythological love story, however, it is Roman. The main characters of the story are Pomona, a nymph, and her greatest admirer, Vertumnus. Like Andrea del Sarto and Rosso, early in his career Pontormo worked in the church of Santissima Annunziata in Florence where he executed the Visitation as part of the decorative cycle of the Scenes from the Life of the Virgin in the Chiostrino dei Voti. The painting depicts the meeting of Mary and her cousin Elizabeth, both with child, symbolically prefiguring the future interaction of their sons, Jesus and John the Baptist. Pontormo shows himself as under the spell of Raphael, arranging his composition on a set of low steps, similar to Raphael's School of Athens. There is an element of refinement and elegance in this work of Pontormo, both in the poses of the figures and in the creation of the architectural backdrop. This early Visitation makes an interesting comparison with his painting of the same subject (at right), which was done about a decade later for the parish church of St. Michael in Carmignano, about 20 km west of Florence. Placing these two pictures together—one from his early style, and another from his mature period—throws Pontormo's artistic development into sharp relief. In the earlier work, Pontormo is much closer in style to his teacher, Andrea del Sarto, and to the early sixteenth century renaissance artistic principles. One attempt at defining mannerist art is to characterize it as art that follows art rather than art that follows nature, or life. [See for example Sydney Freedberg's notion of the 'quoted' form in "Observations on the Painting of the Maniera" Art Bulletin 47 (1965), pp. 187–97.] Though Freedberg did not classify Pontormo as a strictly maniera painter, if we accept that the Deposition does hold a quotation from Michelangelo's Pietà, then perhaps we can understand better how Pontormo fits in as a mannerist and into his own larger history of sixteenth century art. See "An Introduction to Vasari's Story" in Pontormo, Bronzino, and Allori: A Genealogy of Florentine Art (New Haven, CT: Yale University Press, 2001). Pomona was the only nymph who did not love the woods. She prefferred gardens, and so that is where she stayed and that was the only thing she cared about. Pomona was very beautiful and and many admirers. Her greatest admirer was a man name Vertumnus. However, Pomona cared nothing of these men and only for her garden. Vertumnus, being Pomona's greatest admirer, could not go a day without seeing her. He would continue to disguise himself as a different personality every day just to go look upon her beauty without her recognizing him. She grew more beautiful each time he saw her, until finally, looking wasn't enough. Vertumnus devised another plan in which he would make her not only allow him to see her, but her to love him as well. He disguised himself as an old woman and went to see her to sell her fruit. When he saw Pomona admiring the fruit, he said to her, "But you are far more beautiful." With that statement, he kissed her. Vertumnus continued to kiss Pomona and she started thinking this was a little strange. Seeing her suprise, Vertumnus stopped and tooke a seat across from her. He looked at the a grape vine near him. Vertumnus cleverly used a metaphor with the grape vine, saying it would not be as beautiful if it were not for the grapes. He was of course, getting at the fact that Pomona was missing a man in her life. Then he went on saying that the Roman goddess of love, Venus, hated hard-hearted women like Pomona. Vertumnus took one last look at Pomona, and using the metaphor of the grape vine again, told her that she could not stand alone and should love Vertumnus. For Vertumnus had loved Pomona, and would never love anyone else. Also, he would love her garden too. With this, Vertumnus rose and shed his old woman disguise, revealing himself to Pomona. Pomona rushed into Vertumnus's arms, and since then, Pomona's orchard has had two gardeners. Palazzo Strozzi in Firenze hosts until 20 July 2014 a major exhibition entitled Pontormo and Rosso Fiorentino: Diverging Paths of Mannerism. The show tells and compares the story of the two painters who were without question the most original and unconventional, the most anti-conformist and criticized adepts of the new way of interpreting art in that season of the Italian Cinquecento. This landmark exhibition brings together for the first time a selection of some 80 works. Poggio a Caiano is situated north-west of Florence. Poggio a Caiano is most visited for its highly renowned Medici Villa. This Grand Ducal villa is situated on a hill on the shores of the river Ombrone and is one of the most beautiful in Tuscany. The building of the villa was almost entirely due to Laurence the Magnificent who built the Medici Villa on the site of an ancient castle which once belonged to the powerful Cancellieri family of Pistoia. After 1420 it was bought by the Strozzi and finally by the Medici. The construction of the Villa of Poggio a Caiano started in 1485 and followed the purchase on behalf of Lorenzo the Magnificent in 1473 of a large territory which surrounds the villa and includes the areas of Santa Maria in Bonistallo, Ponte a Tigliano and Tavola. Giuliano da Sangallo carried out the project and on the death of Lorenzo the Magnificent in 1492, the construction was merely started. In 1495 the basements, the ground portico and probably the facade were finished. 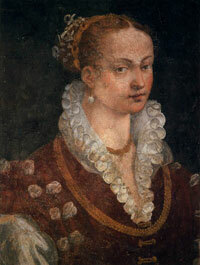 When Lorenzo's son Piero de'Medici was exiled from Florence the works were interrupted and resumed in 1512 when Lorenzo's wife Alfonsina Orsini returned to Florence and intensified in 1515 when Lorenzo's son Giovanni became Pope Leo X. His emblem, the yoke, is imprinted in the center of the ceiling of the main hall (Hall of Leo X). It was only under Cosimo I that the garden and the four bulwarks were completed. Tribolo's project was carried out after his death (1550) by his son-in-law Davide Fortini. In 1562 Giorgio Vasari designed the entrance in Via Pratese and the staircase which is most probably the one in Bianca Capello's apartment. Between 1801 and 1811 Pasquale Poccianti designed and carried out the curved shaped front stairs which lead to the terrace on the front of the Villa and which substituted the original straight stairs designed by Sangallo. He also designed the large internai staircase. The garden was designed by Tribolo on request of Cosimo I and was completed by Davide Fortini. Tribolo also designed the two bulwarks which protect the front entrance, the walls surrounding the Villa and the large building called the Scuderie (horse stables) on the east side of the Villa. The building called the Palatoio or Pallacorda is also attributed to him and can be seen on the rear side of the Villa. In 1552 the secret garden was planted. This could be reached by crossing a bridge and was separated from the main garden by a small road. The garden, as can be seen in the lunette of the Villa by Giusto Utens, (between 1599 and 1602) has a traditional cross shape, with four major and eight minor partitions. In the center a small wooded area was planted to obtain a nearby hunting ground righi behind the Villa. The garden was transformed between 1811, when on the north side the new staircase was added to the front of the Villa, and 1830 when the English style garden was created in the back with flower patches and curved paths. This was designed by Pasquale Poccianti who also designed the large building for citrus trees. The road which divided the Villa from the garden was eliminated thus uniting the two with the construction of a large staircase. Nothing remains of the 16th century garden except for the surrounding walls. At the north end of the garden we find the large lemon tree house bulding , used to protect the many citrus plants during the Winter season. It was designed by Pasquale Poccianti. The Italian style garden today is divided in neatly trimmed patches of flowers and low bushes and a large number of citrus trees, especially lemon trees. Cedrus atlantica, Sequioia sempervirens, Sequoia dendron giganteum and a small collection of roses are the main types of plants we find in the garden. Behind the Villa the garden turns into an English style park with several openings and shady areas and different examples of oak trees such as the large Turkey Oak.